Welcome! The lobby of the Deranged L.A. Crime theater is open! Grab a bucket of popcorn, some Milk Duds and a Coke and find a seat. 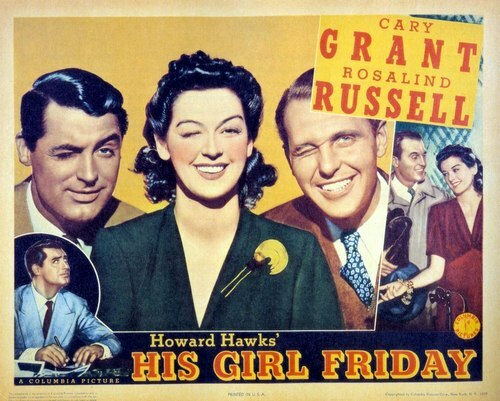 Tonight’s feature is HIS GIRL FRIDAY directed by Howard Hawks and starring Rosalind Russell, Cary Grant and Ralph Bellamy. Okay, I realize HIS GIRL FRIDAY is a screwball comedy and not a film noir, but it does revolve, at least in part, around the upcoming execution of a convicted murderer. Besides, I’m in the mood for something light. Ex-reporter Hildy Johnson, recently divorced from fast-talking newspaper editor Walter Burns, pays him a visit at the office of the Morning Post to tell him that she is marrying mild-mannered insurance salesman Bruce Baldwin. When Hildy enters, Walter is engrossed by the story of the impending execution of Earl Williams, a timid bookkeeper who has been sentenced to die for killing an African-American policeman. To lure Hildy back, Walter lies that his star reporter is preoccupied with the birth of his first child and the paper needs her to cover the story. Hildy rejects Walter’s bait and announces that she is engaged, tired of being a newspaper reporter and now just wants to be a woman. Walter insists upon meeting Hildy’s fiancé and invites them to lunch. At lunch, Walter learns that the couple are leaving with Bruce’s mother, Mrs. Baldwin, on the four o’clock train to Albany. Scheming to win Hildy back, Walter convinces Bruce that only a story written by Hildy can save the wrongly-convicted Williams. Hildy calls Walter’s bluff, but agrees to write the story if Walter will purchase a $100,000 life insurance policy from Bruce. The lobby of the Deranged L.A. Crimes theater is open. Visit our snack bar for a fizzy beverage, a big bag of popcorn and a candy bar. Tonight’s feature is BROTHER ORCHID, starring Edward G. Robinson, Humphrey Bogart, Ann Sothern, Donald Crisp, and Allen Jenkins. 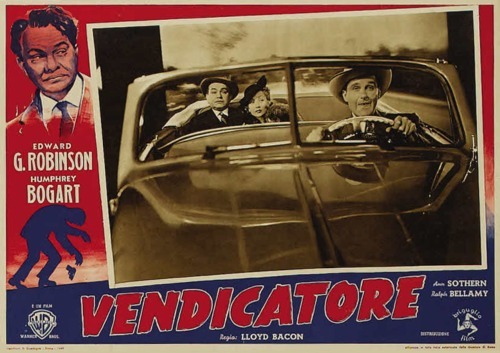 From Wikipedia: Crime boss Little John Sarto (Edward G. Robinson) retires suddenly, giving leadership of his gang to Jack Buck (Humphrey Bogart), while he leaves for a tour of Europe to acquire “class”. However, Sarto is repeatedly swindled and finally loses all his money. He decides to return home and take back his gang, as if nothing has changed after five years, but Buck has him thrown out of his office. The only ones who remain loyal to Sarto are his girlfriend Flo Addams (Ann Sothern) and Willie “the Knife” Corson (Allen Jenkins). Sarto raises a new gang and starts encroaching on Buck’s territory.